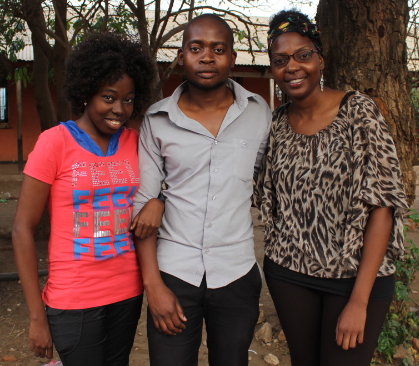 The Volunteer of the Month is Mwaba Chabo (pictured at left), who first learned about Lubuto through an online advertisement recruiting volunteers in October of 2015. A recent graduate with a background in Information Technology, Mwaba was immediately attracted to the opportunity because she loves to read and she loves teaching, especially teaching young children. And once she began volunteering at the former Fountain of Hope Lubuto Library, she was unstoppable—most weeks she spent nearly 40 hours a week at the library, working alongside the staff and assisting with Storytime, LubutoLiteracy, and more. Mwaba says she loves being involved with Lubuto because she has a “heart for people,” and “loves talking to people about the things they go through.” This was already evident to us, given Mwaba’s unique talent for connecting with the most vulnerable and hard-to-reach children. So when an opening emerged for us to hire an Assistant Family Literacy Coordinator to help roll out our new curriculum and its supporting software program, we thought of Mwaba immediately. We are thrilled to be able to say that after nearly three years of involvement with Lubuto, Mwaba was hired as a full-time staff member in January! Welcome, Mwaba.